Climbing Bridelia is a large, evergreen climbing shrub. Leaves are 5-20 cm, somewhat leathery, elliptic-obovate or orbicular-oblong. Flowers are small, in small axillary clusters or long spikes, often subtended by long stipular bracts. Flowers are borne in usually 2-6-flowered clusters in leaf axils, sometimes grouped into many-flowered spikes or on terminal small-leaved branches. Male flowers are 0.6-1 cm in diameter, on very short stalks up to 1 mm. Receptacle is cup-shaped, sepals ovate-triangular, about 4 x 2.5 mm. Petals are spoon-shaped, about 2 mm, 3-5-toothed, disk shallowly cup-shaped, 5-6 mm in diameter. Fruits are oblong, 1.2 cm long, sitting on an enlarged calyx. 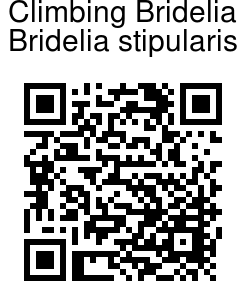 Climbing Bridelia is found in Nepal, India, Sikkim, Burma, SW China, Indo-China, W Malaysia. 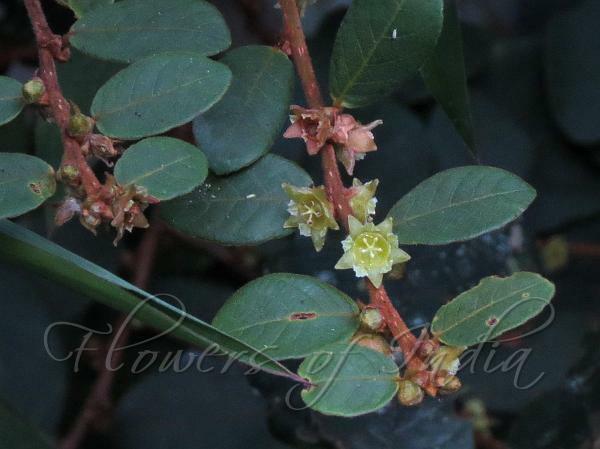 Medicinal uses: Plant is used in pleurisy and exudation. Bark decoction is given to children for cough, fever and asthma and as gargle for sores in mouth. Fresh tender leaves are used for the treatment of jaundice; emulsion for anaemia due to pregnancy. Leaf powder and warm leaf poultice are applied to white spots in the skin. The roots are used as medicine for reducing inflammation and as an astringent antidiarrheal; the fruits are used to induce vomiting and as an antitoxic.